This is the first in a series of descriptive blogs on individual Desert Golf Course Communities in our area. Each week we will be featuring a different community. 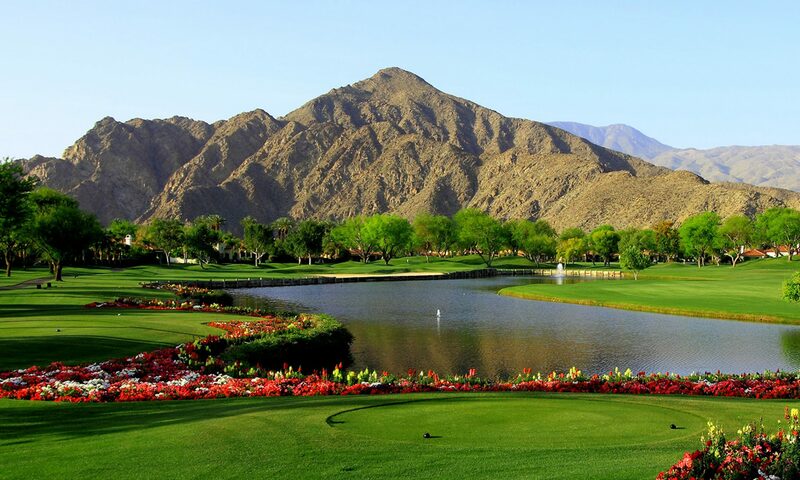 This weeks featured community is Rancho La Quinta Country Club. Rancho La Quinta Country Club is a luxury golf and tennis community of 980 homes established by T.D. Desert Development in 1994 on over 700 acres in La Quinta, California. There are approximately 60 homes currently on the market, ranging from $500,000 to $2,000,000. The Country Club is comprised of two world class golf courses designed by Robert Trent Jones, Jr and Jerry Pate. The courses have previously hosted the PGA Tour’s ever popular “Skins Game” and have recently changed over from “Bentgrass” to “Bermuda” grass to better serve golfers in the desert climate. The 23,000 square foot clubhouse has a main dining room, private dining room, full service clubroom/bar, men’s and women’s locker rooms, Pro Shop and “The Turn” for a quick bite for golfers. The property also has a premier Racquet Club and Pool complex with 9 lighted courts including 2 clay courts as well as stadium seating on center court. The Racquet Club features a Tennis Shop, men’s and women’s locker rooms, a fitness center with state-of-the-art exercise equipment offering Kinetix Health & Performance Center services including certified personal trainers, fitness classes, nutrition counseling, physical therapy, massage therapy and spa treatments. In addition, The Racquet Club features “The Cantina” for breakfast, lunch and dinner service. Patio dining is also available courtside or poolside. The main pool at The Racket Club is a Junior Olympic size. Additionally there are several community pools and spas located throughout the community. The Racquet Club coordinates very popular leagues for Bocce Ball and Pickleball. Rancho La Quinta Country Club is one of many golf clubs mentioned in our Golf Resource Guide. This guide outlines golf club prices, locations and home price ranges. What will it be today? Golf, pickleball or both? Over the last few years I’ve been hearing more and more about pickleball. It’s definitely a sport that is gaining a lot of players here in La Quinta, Palm Desert, Palm Springs and the greater Coachella Valley, and that seems to reflect a growing interest all around the country. According to Tennis Club Business Magazine, pickleball is growing faster than any other sport in the country. It’s a sport that’s played with paddles and combines elements of tennis, squash and table tennis. The court is smaller than a tennis court (the size of a double badminton court) and often pickleball is played on adapted tennis courts. There are a lot of dedicated players in our area and one pickleball court directory listed 11 places to play in Palm Desert alone! In La Quinta, there are pickleball courts at PGA West. To give you an idea of how quickly this sport is catching on, one survey of some local tennis courts found that over about a one-month period, 234 pickleball players used the courts compared to 54 tennis players. The sport gives players a great workout and is a lot of fun while at the same time it’s a bit easier on the body. It started out as a backyard game for kids, then became popular with older players and now there are national competitive divisions for virtually every age group. Its increased popularity up and down the Palm Springs area is testimony to the active lifestyle here: If you participate in a sport, you’ll find plenty of people to play with when you have a home in La Quinta or any of the surrounding communities. Of course, sports like this are always great ways to meet people and make new friends. I’ve told you where some pickleball courts are, but if you want to see the relative location of golf courses here, you need to download our Golf Resource Guide. You’ll get the “lay of the land” as it relates to all the great courses plus the towns and neighborhoods where you would enjoy living. These include communities like The Mountain Estates, The Enclave, La Quinta Resort Spa Villas, Los Estados, Puerta Azul, Santa Rosa Cove and many more. Browsing our guide, you’ll see that golf courses including Mountain View Country Club, PGA West, The Hideaway, The Tradition, The Citrus Club, The Palms Golf Club, Silver Rock Golf Resort and many other fabled courses are always nearby. Our guide lays them all out for you so you can get the ideal overview. When it’s time to go beyond an “overview” and get into the specifics of what best suits your needs, we’re here to answer your questions and help you focus your search. We would be privileged to serve you.